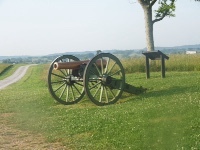 My Civil War Obsession: Should Perryville become a National Park? Should Perryville become a National Park? 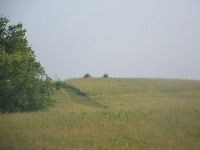 Perryville Battlefield is currently a Kentucky state historic site, basically a state park. I have heard brief mention in the past year or so of the idea of it becoming a national park and now that suggestion has come around again. This article argues that turning it over to the National Park System and making it a national site would be a good idea and would benefit the region. Chad Greene, President of the Friends of Perryville, and someone who has done a lot of work for the park, disagrees and posted these comments on Facebook. I hope the image shows up large enough. It's hard to tell from my iPad. Most in the comments section agreed with his remarks, but a couple agreed with the article's premise. A park employee posted in the comments that many visitors he meets are surprised to learn that it is not a national park and is "just" a state site. The article about the NPS' issues is here and states that the NPS delayed over $11 billion in maintenance projects last year. $11 billion. Is that a good situation to which to add Perryville? What would happen to the walking trails, an absolutely crucial part of the park? Would they still be mowed or allowed to become overgrown? Also, I know the park has started least discussed, perhaps even started, new programs to reintroduce native grasses to the park and improve the habitat for quails, both of which souls make the land more like it was in 1862. Would these programs happen or be "deferred" like so much other maintenance? The first article mentions the idea of a new visitor center, but I'm not sure I like that. I think the current welcome area/museum is fine, even without restaurants or other special areas. A bigger center would be nice in an ideal world, but is it worth it in this one? Should there be another modern building on the land, after several have been removed? Then again, I am not a resident of Perryville or Boyle County, so maybe more economic growth would be welcome. Of course, it's almost always welcome anywhere, but would a visitor center or national park status really attract more visitors or spur economic growth? The people interviewed in the story were already there even without such status. It would not affect my annual trek to the park, though I could see how the word "national" might get the attention of non-Civil War or history buffs since "national" sounds bigger, maybe more important, than "state." Perhaps it would increase attendance and donations, but would that last or just create a quick burst of initial curiosity? The most well-known national park in Kentucky is Mammoth Cave. I have been there but never because it was a "national" park. I went because it was an interesting site (or because my parents decided to take us :), ) but I don't think "national" status had anything to do with it. There are a couple of other national sites and trails like the Lincoln Birthplace, but, again, the "national" aspect of them has no special attraction to me (though I also must admit I do not visit many state parks either.) I suspect the same would hold true for Perryville. If people are interested in the Civil War, they may visit, but if they have no interest in it, would the word "national" matter? If so, would it attract them more then once? I guess if you get them there once, you have the chance to catch their interest and give them reason to return, but would this change by itself attract many first-time visitors? Also, the couple of times I have attended re-enactments at Perryville, I have found them to be absolutely terrific events. 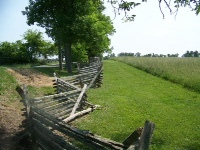 Knowing they were on the actual land where the battle took place added to the feeling of authenticity. With national status, re-enactments would either be eliminated or moved elsewhere. That does not sound good to me. Another issue is the amount of time and effort needed to make a change. Are the federal bureaucracy and regulations worth it? 5 years of study and work seems like a lot. Have other Civil War battlefields gone from state to national status recently? If so, how has that worked? Maybe I will try to look into that but if anybody knows of such instances, please let me know. In the end, perhaps it's funny, or maybe ironic, that a discussion over a Civil War battlefield evolves into a debate over the roles of state versus federal government. You know my thoughts on this one, but I appreciate your well-written post. I never realized the maintenance budget was billions behind, I know it was millions, but billions? Confirms what I said about the Pea Ridge walking trails...many are overgrown.